I have used social media during my entire time in college. I am constantly using Facebook, Twitter, and LinkedIn. Other social media sites I have experience with is Blog Pulse, Social Mention, and Twazzup. I used Facebook and Twitter on a daily basis during my internship at Raidious. I was constantly creating, managing, and monitoring content for a variety of brands. During my last semester in college I worked on a campaign with a group of students and as a team we created a Facebook and Twitter account for our client. We updated information and tweeted current news on both social media sites. I also learned to use WordPress in certain courses I took while in college. Along with our clients social media sites, I utilize mine own personal sites in the same manner. During my college career I worked on multiple group projects and campaigns. I utilized my leadership skills during this time by setting deadlines, distributing work evenly, and making sure everyone in each group was able to work together as a team. I am a recent graduate from Purdue University and studied PR and Advertising. I am currently looking my career in either pr, advertising, communication, and/or any other related fields. While in college, I was an active member of Public Relations Student Society of America. I find myself to be a reliable, motivated, and creative worker and would make a great contribution to any organization. I recently completed an internship at Raidious. My responsibilities included creating, managing and monitoring social media outlets for various clients. Additionally, I was assigned to the Super Bowl XLVI Social Media Command Center. Through the Command Center, my responsibilities included monitoring Facebook and Twitter and responding to questions and concerns from fans attending the Super Bowl events. 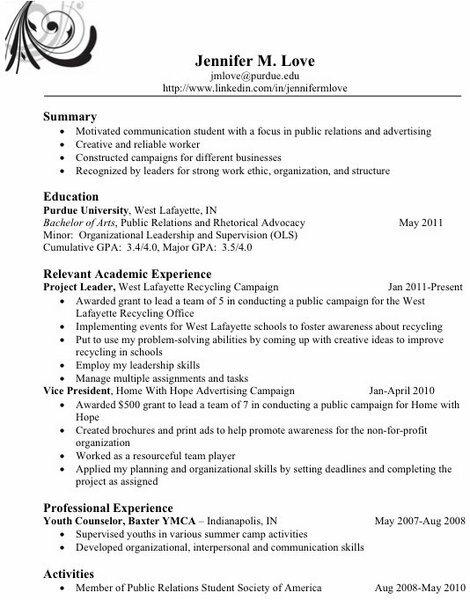 During my last semester at Purdue I worked on a non-for-profit campaign for the West Lafayette Recycling Office with a group of 4 other Purdue Students. We worked with the West Lafayette Elementary Schools and High School to expand knowledge among the students about recycling, with hopes of increasing the recycling intake. I enjoy scrapbooking, spending time with my husky, and baking during my free time.